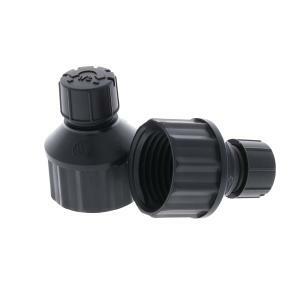 These Adjustable Drippers on 1/2" FPT are easily adjusted from 0-10 GPH flow by simply twisting the cap. The flow and the radius of the wetted area can be adjusted from a gentle stream pattern, to drip, or off. These are often used in 1/2" riser applications. Coverage area is from 0 to about 3'. Flow rate and coverage may vary slightly with different system pressures.